This article covers the creation of Classic Agent and Open Agent logfiles along with Flex Automation logs and Dr.Watson crash dump files. It does not cover WER (Windows Error Reporting) as these require a level 3 security certificate to be able to install Microsoft's Winqual WER reader. QAP_DEBUG_AGENT - overall/general. If this fails use QAP_DEBUG only. 1. First, make sure that no SilkTest or Agent processes are running. Delete or rename c:\[flagname].log if the file exists. Change your working directory to your SilkTest installation directory. 3. Start the Agent manually. Go through the scenario to reproduce the problem. The file c:\[flagname].log file should be created. 1. Check UAC (User Account Control) and ensure that itis turned off. If UAC is turned on, this prevents SilkTest from generating the debug log file. 1. Go to Start | Run and enter 'secpol.msc'. 2. Dismiss the UAC if challenged. 4. Enable 'Accounts: Administrator Account Status' policy. 5. Click OK and dismiss the Policy console. The root administrator should now be visible in Control Panel | User Accounts. If you now login as the root administrator the debug.log file should be created successfully. 2. Delete all of these xml files. 9. Rename log4j.properties.old to log4j.properties. The reason for the renaming of the properties files is as follows: when the Open Agent starts it reads the log4j.properties file which instructs the agent what events to log. The normal log4j.properties file only contains minimal logging instructions (for performance reasons). Therefore we ship another one (log4j.full.properties) which instructs the agent to log much more. This file is normally never read by the agent because it just searches the log4j.properties file, so in order to make the agent log almost all events we need to rename the log4j.full.properties file to log4j.properties. or run the command "drwtsn32 -i" from a cmd prompt. The latter is preferable as it is easiest. 1. To start Dr. Watson, click Start, click Run, and then type drwtsn32. 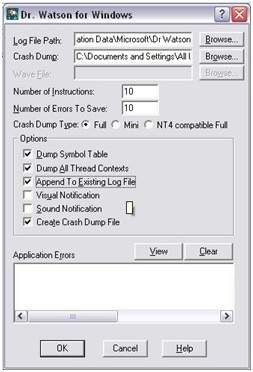 Make a note of the paths to the Log & Crash dump files as this is where the files will be generated. 3. Navigate to the above paths and remove any old log files. 4. Close the Dr Watson via the Ok button. The next application crash will be logged within the Dr. Watson Log Files.